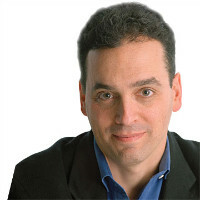 Best-selling author, business thinker, and former White House speechwriter, Daniel Pink has been credited with defining a new era in the workplace. His book A Whole New Mind examined the kinds of “right brain” skills that will be required as we move from an Information Age to a Conceptual Age. His new book, Drive, looks at the science of motivation, and he’ll be revealing key findings about the forces that will drive employees in well-led organizations of the future: autonomy, mastery, and purpose. Pink is also the author of Free Agent Nation, and his articles on business and technology have appeared in The New York Times, Harvard Business Review, Fast Company, and Wired. Is anyone hungry? Ron. Gave him a couple energy bars. That’s a motivation. Humans have other motivations other than biological motivations. That’s another motivation, 2nd drive, reward/punishment drive. Researchers did a study with MIT students. Split them into 3 groups – little reward, bigger reward, huge reward. For tasks that didn’t require cognitive performance the higher the pay the better the performance, but tasks that required cognitive performance got worse with bigger rewards. Punishment/reward motivators work well for simple tasks but not for complex tasks that require creativity. Redgate software, doing things differently, sales people worked on commissions and were gaming the system, made the compensation more complex, sales people upped their game. Went to top 2 sales guys. Told him that they were going to eliminate commissions and instead raise base salary and do profit sharing. First guy said it was a good idea, but the other guy wouldn’t go for it. Second guy also liked the idea, but thought the first guy wouldn’t go for it. 1) Human beings are machines. If you press the right buttons in the right people, they will do what you want. That is not true. I defy you to find me a 2 year old that is passive and inert. Our nature is to be active and engage. That is our default, factory setting. Management is a technology designed to get compliance. We don’t want compliance we want engagement. Give people autonomy over their time, team, task, technique. Example: Aussie software development co. Thu PM work on anything you want that’s not a part of your job. Only requirement is that have to show everyone else what you created the next day. Call it FedEx day because you have to deliver over night. Worked so well that they now have 20% time (work on whatever you want during 20% of your work week. Google does 20% time. Google News, Gmail were not official projects but 20% projects. Implement this slowly. Have to provide “scaffolding.” Try a FedEx Day. 10% time. Don’t start with everyone but a small group. Don’t do it forever, but for a test period. Playing the bassoon on the weekend is a strange behavior. Why would anyone do it? Because it’s interesting. Teresa Amaboli (sp?) did research, asked people to chart their motivation every day. Single largest motivator was “making progress.” Days when people were making progress those were the days they felt most motivated, engaged, and loyal to the organization. “Flow” – when a challenge is so well matched to our capabilities that we loose track of time. We’re more likely to find “flow” at work than in leisure because we’re passive in leisure. You have to get feedback to know if you’re making progress, but the workplace is one of the most feedback-deprived settings int he world. Once a year performance reviews. Imagine if a tennis player got feedback once a year. Performance reviews are usually not honest conversations. How do we get more feedback? Encourage people to seek out feedback. Great athletes have goals, but they also meticulously track their progress. There is a palpable sense that a page is turning. We are reaching the limits of the profit motivation. There’s a rise in the purpose motive. When the profit motive becomes detached from the purpose motive, bad things happen. Diagnostic tool from Robert Reisch. Listen to the pronowns people use. Do they say “we” or “they.” “They” indicates a sense of alienation and discontent. One person can’t change an organization. Change happens by individuals taking small steps. Everything good in life begins with a conversation.